Officials haven’t released the official cause of fatal accident on US 23 Thursday. Emergency workers study the mangled remains of Zachary M. Strickland’s Chevy Malibu following Thursday’s crash. Emergency crews needed several hours to clean up US 23 following Thursday’s fatal accident. The accident which killed a 25-year-old Lucasville man early Thursday evening was still under investigation Friday morning according to the Ohio State Highway Patrol. OSHP said Zachary M. Strickland was traveling south on U.S. 23 in a 2005 Chevy Malibu just before 5:45 p.m.
A trooper at the scene said Strickland was alone in his car. According to OSHP, Joseph L. White, 40, of Ironton, was traveling north on U.S. 23 in a 2011 Toyota Camry with his wife and a juvenile son. Douglas L. Courtney, 65, of Peru, Ind., was headed north as well in a semi-tractor trailer. OSHP alleged Strickland drove left of center, striking White’s vehicle before slamming head-on into the semi driven by Courtney. As a result of the crash, Strickland suffered what proved to be fatal injuries and was pronounced dead at the scene by the Scioto County Coroner. Courtney received minor injuries and was treated and released from the Southern Ohio Medical Center. According to the OSHP, no one in White’s car was injured. Because of the incident, U.S. 23 was closed in both directions for several hours according to the Scioto County Emergency Management Agency. The roadway did not reopen until roughly 10 p.m. The backup on northbound 23 was at least a mile long at around 8 p.m. Thursday. One truck driver stuck in the lineup said he had been waiting for well over an hour. Told it would be at least another hour before the road opened, the man seemed to take it in his stride while other drivers clearly were frustrated. SCEMA said the long closure was needed to clean up spilled diesel fuel and oil, as well as to give investigators time to do their jobs. Little information about the man killed in the crash has been released. It is known he was an EMT and engaged to be married. 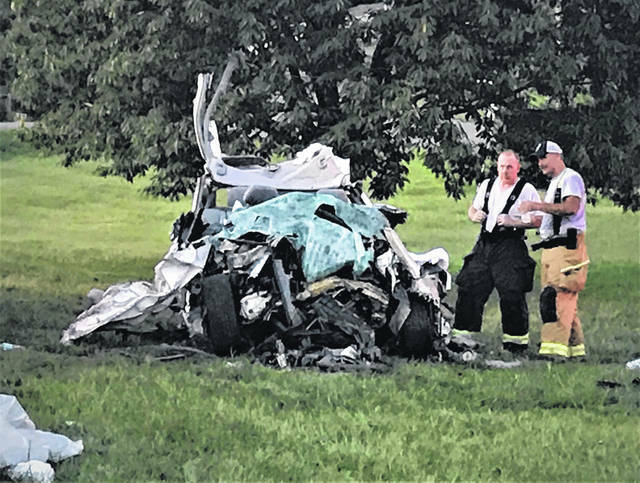 https://www.portsmouth-dailytimes.com/wp-content/uploads/sites/28/2018/08/web1_mangled-2.jpgEmergency workers study the mangled remains of Zachary M. Strickland’s Chevy Malibu following Thursday’s crash. 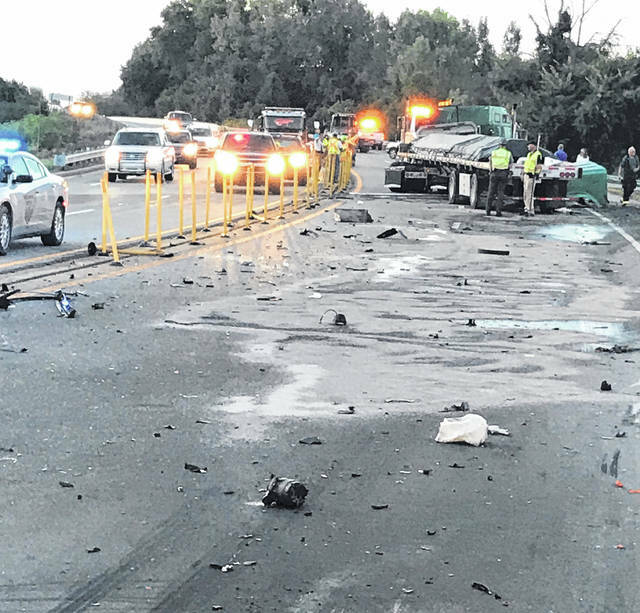 https://www.portsmouth-dailytimes.com/wp-content/uploads/sites/28/2018/08/web1_wreck-A.jpgEmergency crews needed several hours to clean up US 23 following Thursday’s fatal accident.